Herbs in this section have an action on the nervous system of the human body. These plants may have a researched or traditional use in the relief of nerve pain, reduction of anxiety or as uplifting tonics. Borage to lift the spirits and lose the wrinkles! Price notes Pliny named the plant euphrosinum. Believed due to the happiness borage instilled. The word borago is possibly from Latin ‘burra’ meaning hairy, wooly or shaggy. It is indeed a rather ‘hairy’ plant as seen from the close up photo. Kusmirek suggests the Latin name means ‘courage’ taken from Latin ‘cor’ for heart. 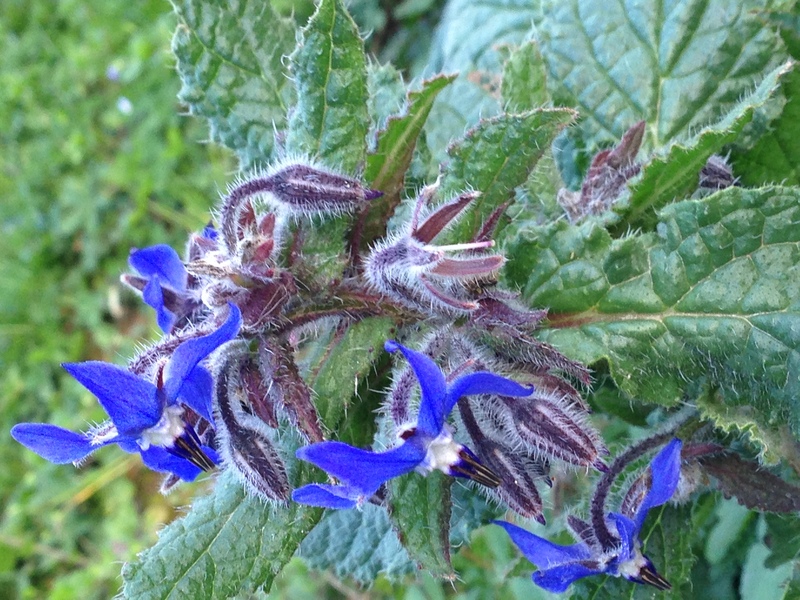 Borage was used as a talisman in dangerous times. Borage seed oil is sometimes called star flower oil. The flowers are quite star like. Often found as a garden plant. You will also find it happily growing throughout the Mediterranean on any rough ground, as in the picture to the left. All pictures in this post are in the Aude some wild, some from my garden. Podlech advises flowering is normally May to September. The close up image of the flower from my garden in March when the plant was already in full bloom in the south of France. Mességué describes borage as very easy to grow in the garden. He advised gathering just before the flowers open. Choose from whole plant (leaves and flowers), a cluster of flowers or single flowers. If using the whole plant or a cluster of flowers he notes they should be hung up to dry in little bunches. 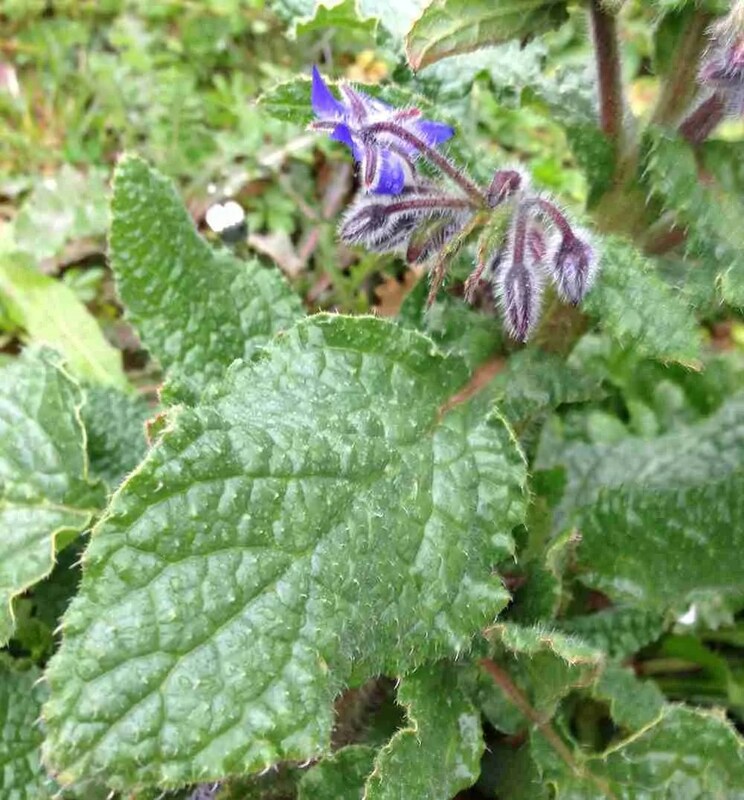 McIntyre discusses the use of borage as a heart tonic. Noting the plant has an ancient reputation for its revitalising action in exhaustion and convalescence as well as its ability to calm palpitations. Believed to provide courage linking with Kusmirek’s interpretation of the Latin name. The herb was used for grief and sadness. 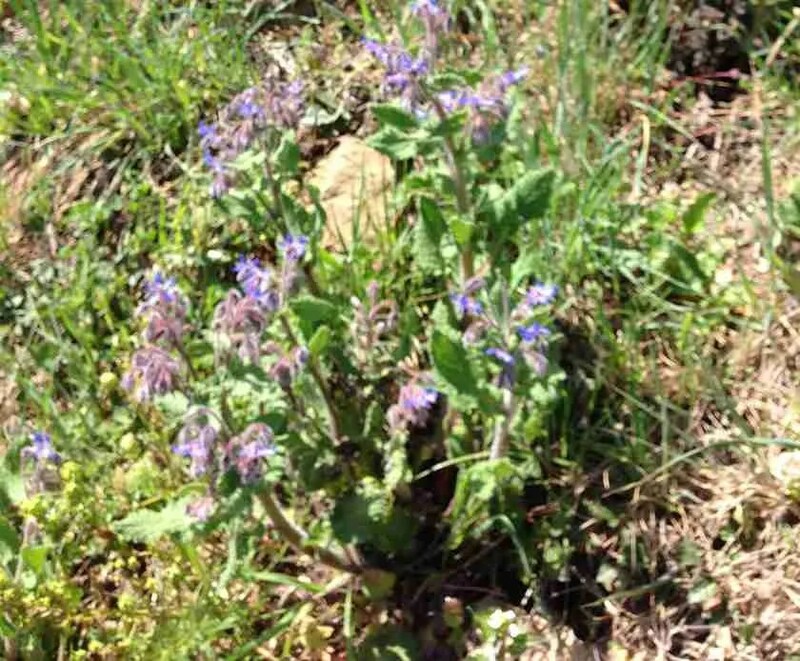 A description by Culpeper recommends borage for drooping spirits by cheering the heart. McIntyre advises the mucilage content is soothing to any sore and irritated conditions highlighting sore throats, chest infections, gastritis and irritable bowel syndrome. McIntyre has found borage tea beneficial for skin complaints like boils and rashes as well as being useful for rheumatism and arthritis. Price recommends the oil externally for eczema and psoriasis and advises it will also defer wrinkling! Mességué tells us his father called it ‘soothe-all’ due to the comforting and soothing effect it had for anyone suffering with bronchitis, pleurisy, catarrh or congestion and also for rheumatism. Mességué himself prescribed foot-baths or hand-baths for treatment of colds. The successful dosage, a handful of fresh or dried borage per litre (1¾ pints) of water and two baths a day. It is one of my personal favourites. When studying the herb with Christopher Hedley he advised using the herb for depression in Melancholic individuals particularly with dryness or poor liver function or for a Choleric with burn out. Personally I prefer borage as a fresh, cold infusion. This tea uplifts the spirits and the taste has a soothing and moistening effect. Menzies-Trull describes the key action as adrenal trophorestorative. Hoffmann adds anti-inflammatory, diaphoretic, diuretic, emollient and expectorant. McIntyre includes similar actions and adds decongestant and demulcent too. Ganora describes borage as containing rosmarinic acid and the seed containing gamma-linolenic acid (GLA). Rosmarinic acid is anti-microbial, antioxidant, anti-inflammatory and anti-allergenic. The following quote summarises borage perfectly. I first read this in a Maurice Mességué book. He accredited the verse to the old medical School of Salerno. 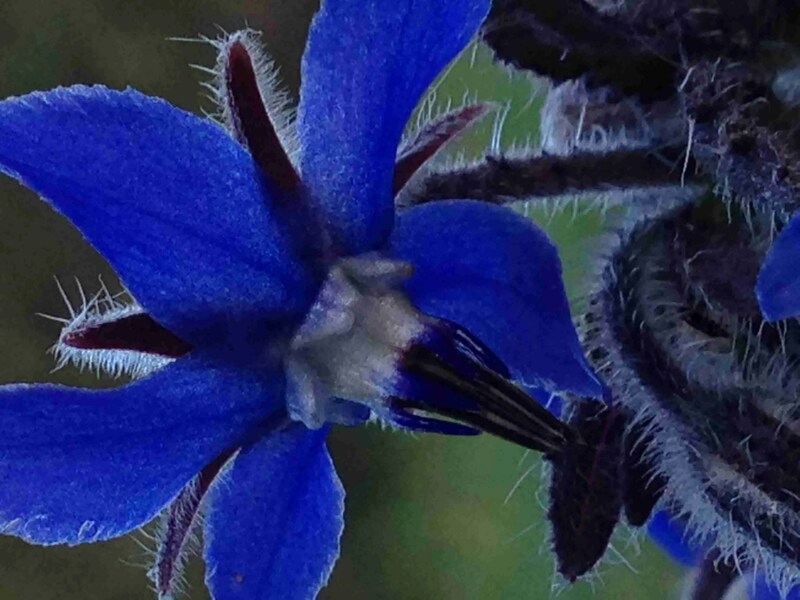 Author NicolePosted on 12th March 2016 26th July 2017 Categories BoraginaceaeTags Dermatology Skin, Immune, Nerves, Recipes, Wild FlowersLeave a comment on Borage to lift the spirits and lose the wrinkles!